Three such skins are modeled after the game's bosses and are now available as paid DLC on PlayStation 4 and PC. In return for purchasing the "Three Enemigos" character pack, players can choose from El Muñeco, Uay Pek, or Jaguar Javier, each of which come with unique attributes and PlayStation trophies. On December 7th, even more skins will be available through the "Proving Grounds" DLC (seen in motion above), wherein players must work their way through a new challenge level with the help of five different trainers. Upon successful completion of each trainer's section, the trainers will make their own skin available, and completing all fifteen levels with gold medals will unlock a final, secret character skin. In addition to all this new content, Guacamelee! 2 will be making its way to the Nintendo Switch in just over a week on December 10, and then to the Xbox One sometime next month. No word on whether this DLC will be available for those versions at launch or will come sometime later. Character packs are always fun and will definitely offer more variety in co-op play, but the new challenge level pack is especially exciting, as players will truly get to test their luchador mettle. 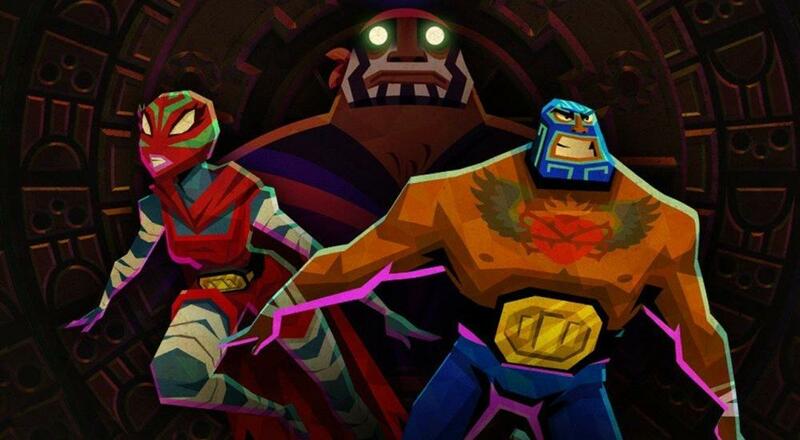 If you're interested in reading more about Guacamelee! 2, out now on PlayStation 4 and PC, be sure to check out our review. Page created in 1.0529 seconds.